This sculpture shows key scenes in the life of Buddha beginning with his birth in the lower left corner and also including his illumination and death. Gautama Buddha was born in 563 b.c. in northeast India. 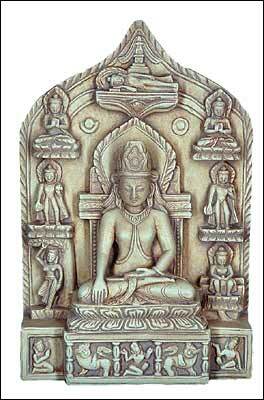 The Buddha was the son of the King of the Sakyas. Suddhodana, who ruled at Kapilavastu, on the border of Nepal. His mother was Queen Maya. He was named Siddhartha. He lived amidst the pleasures of palace life and at age 16 he was married to Princess Yasodhara. They had a son named Rahula. After seeing a decrepid old man, an invalid, and an ascetic beggar, he learned of suffering and decided to embrace asceticism. Soon afterwards, at age 29, Siddhartha left the palace and his family and went to a hermitage where he became the monk Gautama, or, as he is still called, Sakyamuni (The ascetic of the Sakyas). One day, meditating under a sacred figtree, he attained perfect illumination (Bodhi). He had become a Buddha. From there on he traveled and preached for 44 years what was to become one of the main religions of the world. He died at Kusinagara at age 80.